Right-click on the atom to open the popup menu. Select the required repetition number from the Link node submenu. Marvin finds out the outer (non-repeating) bonds for you. 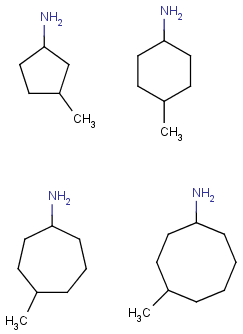 Select the atom you would like to be the link node and two neighboring bonds for outer (non-repeating) bonds. Right-click anywhere on the canvas to bring up the popup menu. Select the required repetition number from the Link node submenu. The Link Node submenu can be reach fro the Atom menu as well. If it is not possible to create a link node for the specified configuration (for example at ring fusions) an error message is thrown. Outer (non-repeating) bonds will be denoted by brackets crossing them, and the repetition numbers will be put on the atom. 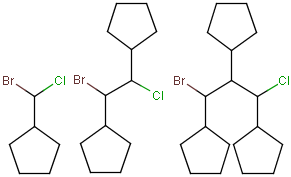 All portion of the molecule connected to the link atom through non-outer bonds are supposed to repeat together with the atom. To edit a link node repetition number or change outer bonds, repeat the drawing steps above. To make a link atom ordinary atom again, select Off from the Link node submenu or more simply, it can be overwritten.